Heavy Rock emphasizing melody without losing sight of musicianship and progressive roots. Great vocals with beefy guitars, excellent rhythm section and occasional keyboard. LISA FRANCIS-VOCALS Realizing she could sing by the age of 5, she started performing as an amateur. Influenced by Alice Cooper, KISS, and other '70s hard rock bands, she started playing rock clubs by the age of 15. After performing professionally for over 10 years, she became sidetracked from music and earned a B.A. in Communications. Lisa returned to music in the summer of 1999. She currently helps out Sonus Umbra with some vocal duties. PETE LARAMEE-GUITAR Pete's been playing guitar for over 20 years. He played in a jazz band while in college, where he earned a B.S. in Communications. Influenced early by Van Halen, the Dregs, and all of the '80s guitar players, Pete returned to rock upon his graduation and played in several rock bands. Besides the "Bane," Pete has been hired to sit in with other Baltimore-based prog bands and in 2002 he recorded a guitar-based, all-instrumental CD, Alone But Not Lonely. JEFF LARAMEE-DRUMS Jeff's been playing since the age of 12. Originally from Vermont, he and his brother Pete played in circuit bands throughout New England and northern New York before moving to North Carolina, where Jeff played in an all-instrumental trio called "T-BO." Jeff's broad influences include Yes, Marillion, and Queen. Jeff has also been a member of Sonus Umbra for 4 years. LUIS NASSER-BASS In 1995, Luis came to the United States from Mexico City to pursue a doctoral degree in Physics. Luis brought with him a tremendous amount of experience from both his own project, Radio Silence, and his session work supporting other bands as a live and studio musician. Luis grew up listening to Pink Floyd, The Who, and Rush. Radio Silence evolved into Sonus Umbra, which has become a successful progressive rock band. Luis also sits in with Might Could and Uncle Gut. THE BAND In 1994, Pete and Jeff moved to Baltimore to find like-minded musicians. Within 18 months, Kurgan's Bane had formed and played numerous shows, but needed some new members to get to the next level. They soon replaced their singer. In early 1997, the band was fortunate to find Luis available and he immediately joined. His playing complemented that of their own and his writing added a new dimension to their sound. In early 1998, Kurgan's Bane released their first CD, Search from Sea to Sea. It received sparse, yet international, radio airplay and earned positive international reviews. A few months later, the Bane found themselves needing to again replace their singer. They could not immediately find anyone to fit their style and their demands so, in the interim of the next year, they played all-instrumental shows. In the summer of 1999, Lisa became the new singer after auditioning for only 15 minutes. She had her first performance with the band 10 days later. In January of 2000, the band went back into the studio to record The Future Lies Broken, which was released throughout Europe by the Swedish indy label Record Heaven. Future received some international airplay and some great reviews. Throughout 2001 and 2002, the Bane played numerous shows on the east coast to support the CD. Unfortunately, starting in 2002, outside projects and various medical procedures sidelined the band for over a year. And in September of 2003, Hurricane Isabel swept through Baltimore, bringing three feet of water into the "Bane" house. It took several months to get things squared away. Now that things are back to "normal," we are releasing our new CD. It is called Camouflaged In Static and we are now booking shows to support the disc. We are eager and anxious to play live again and have people hear our new material. This CD Rocks And very Refreshing.Stand out tracks are I'm Alive ,Mirrage And Time has Come. Great prog-rock with fantastic vocals. It took several listens before I realised that there are very few keyboards used on this album - yet the sound is incredibly full. I put that down to the skill of the guitarist and the ever-changing but always tight rhythm section. Musically, the album is quality prog-rock with good variety of sounds, tempo, rhythm. Add to the that the beautiful vocals of Lisa Francis, and you have an album that will be listened to many, many times. Overall, a very solid release, well worth checking out. 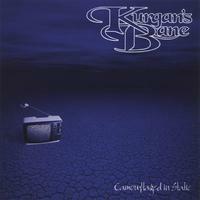 Welcome to the fascinating new CD of KURGAN’S BANE from Baltimore. The listener will be taken along on a progressive journey, mixing rock riffs with various different layers. Especially the instrumental parts are moving from one way to another, constantly asking for your special attention. Lisa’s vocals are fresh, and she gives her bandmates enough room to express themselves in long instrumental breaks. Which results in a whole new approach of the progressive rock sound of today. It never gets too complex, but it’s far more than just the ordinairy rock music. Here and there, you may hear some RUSH, DREAM THEATER or FATES WARNING influences, but the warm sound of Lisa’s voice is a special treat here. Let’s take “Time Has Come” as an example here. The song works itself towards the time the guitar solo appears. A normal approach would be that the song continues after the solo, with a refrain and slowly works itself to the ending. Instead, they put in a longer instrumental part, in which bass player Luis Nasser may prove his skills. That little part lifts the songs up to a much higher level. And this is just one example of the little innovative things, that KURGAN’S BANE put into their music. Besides Lisa and Luis, the band still exists of the Laramee brothers Pete on guitar and Jeff on drums. “Asstro” is the only instrumental track on this new CD, which runs for a full hour. For me, one of the highlights on this new CD is “The Spectator”, because of its mindblowing guitarwork. If you’re a guitar fetishist like me, you will agree. The band may not be as progressive as LANA LANE for example, but they prove there is still room for good progressive rock music out there.